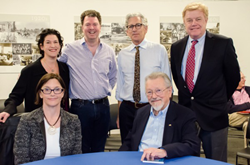 Wine authors speak at Menlo College for Authors Roundtable. 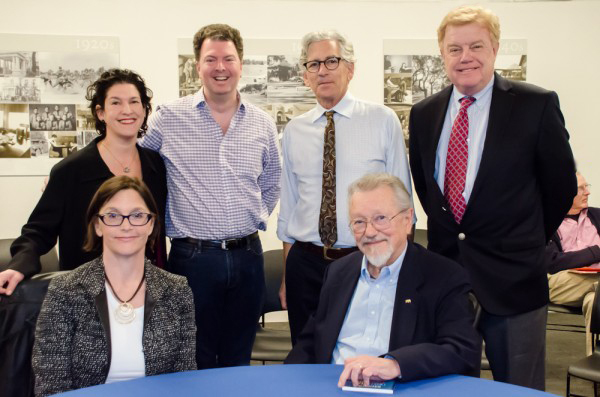 Five well-known authors met recently at Menlo College in Atherton to converse about cabernet, chardonnay, vineyards, prices and the latest trends on wine. Listening to the discussion on wine at Menlo College was a bit like eavesdropping on good conversation of a nearby table while you’re dining out. The conversation by nationally-known wine writers at Menlo’s Authors Roundtable series— fascinating, intriguing, and mysterious—offered listeners a drink for thought, and the chance to compose a list of recommended wines and terms to look up at home. Richard Moran, President of Menlo College and owner of Moran Manor Vineyards moderated the evening. Wine maker Sheridan Warrick, who has an admitted “soft spot for cabs [cabernet wine]” recalled how as an editor at Health Magazine he was beckoned into writing about wine. His interest was piqued when he saw France at the bottom of a chart of countries with heart disease. Already a seasoned wine-maker, he surmised it was good for the heart as well as the palate, and felt compelled to share the information with others. Whether you’re drinking cheap wine such as Two-Buck Chuck, or Screaming Eagle, a California wine from Oakville, California considered to be a cult wine, the activity of drinking wine is a communal experience. “Sharing sets a tone in wine country that makes it a better place,” said Moran.